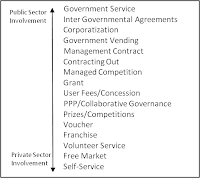 In the last posting for my featured Govloop series and Phase One Consulting Group’s “Transformation in the Federal Sector” blog, otherwise known as “jennovation”, I highlighted the major motivations for public-private partnerships. In the discussion resulting from that posting, it was clear that there was some confusion about what forms public-private partnerships can take. Are contracts and partnerships one in the same? Are grants a form of partnership? Furthermore, and more importantly, are all forms of partnership equally supported and scrutinized by the Government? There are many different forms that public-private partnerships can take. 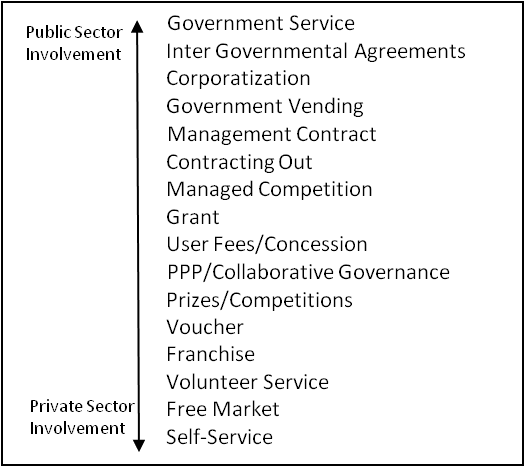 Figure 1 displays some of the partnership structures that are common depending on the degree of private and public sector involvement they require. However, there isn’t a “one size fits all” partnership structure for similar service provisions. To illustrate that point, let’s look at two similar road construction projects that used very different partnership structures to provide a new transportation option for the public: The Dulles Toll Road Extension in Virginia and the I-595 Express in Florida. Now known as the “Dulles Greenway”, this road construction project kicked off in the late 1980’s, when a group of private developers proposed that a 14-mile road extension be built starting at the airport and ending in Leesburg, VA. When first proposed, the Commonwealth of Virginia did not authorize private roads to be built. So the coalition’s first stop was Richmond, where they worked with lawmakers to pass the Virginia Highway Corporation Act of 1988 that authorized private roads in Virginia. Readers from the DC area, ever wonder why the toll on that road is so “high”? Well folks, it’s largely because that road never would have been built without those tolls paying back the upfront construction costs and ongoing maintenance expenses. In this partnership, the tolls you pay, go back into the pockets of the private developers that paid to build the road. In the end a road was built that required significant public oversight, but that was largely privately developed. The road opened for traffic in 1984 and is currently owned and operated by a private group known as the Toll Road Investors Partnership II. This example of road construction and maintenance was much more towards that bottom end of the spectrum—private involvement—in Figure 1. Let’s fast forward nearly two decades. This roadway improvement project, including the construction of several express toll lanes, began in 2009 and is expected to be completed in the spring of 2014. The road construction project is being implemented as a public-private partnership between the Florida Department of Transportation (FDOT) and a private concessionaire—the I-595 Express, LLC (ACS Infrastructure Development)—to design, build, finance, operate, and maintain the roadway for a 35-year agreement term. This is particular type of concession contract, one of the partnership types listed in Figure 1. With this concession contract, the FDOT has more control over the roadway than VDOT does with the Dulles Greenway. Among its partnership responsibilities FDOT will: provide management oversight of the contract; install, test, operate and maintain all tolling equipment for the express lanes; set the toll rates; and retain the toll revenue. private companies profit off of publicly used infrastructure. Ultimately the end result would not have been possible without public and private sector involvement. Neither could have done it completely alone—though there were many options for HOW they could partner. Hopefully these examples show that although the most common partnership arrangement are contracts and grants, that there are several other partnership “vehicles” that government’s have to produce public value. These options might just not be on their radar. As always, please feel free to reach out to me at any time during this series to continue to conversation.